View More In Handheld GPS Units - Page 2. 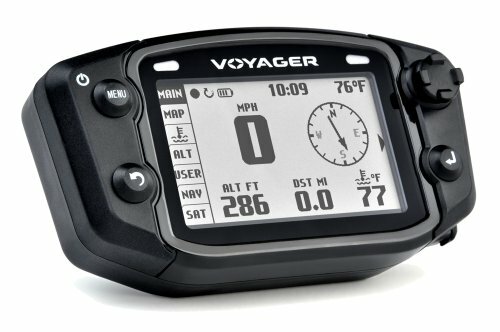 Voyager is like no other GPS you have seen on the market. The one and only GPS designed and manufactured for off-road. Whether you ride motorcycles, ATVs, snowmobiles or 4 wheel drives, Voyager is your unit. Display: The Voyager 400 x 240 WQVGA LCD display has no rival on the market, featuring incredible resolution and contrast. In intense sunlight the transflective properties go to work creating a bright, vivid display. An LED backlight lights the display after the sun goes down. Mounting: Voyager mounts directly to your vehicle, bolted at or below the handle bars. This unique mounting solution allows Voyager to become an integral part of your vehicle. Voyager is the first GPS product that has a dedicated peace-of-mind mounting system for an off-road motorcycle. Smart data logging: When your engine stops so does the GPS trail logging - eliminating random data points from your track when you're not moving. Explore new trail areas with confidence. Voyager also offers on and off the trail file sharing between units via the waterproof MicroSD card (reads most GPS brands). Temperature: Voyager provides both ambient and engine temperature. Engine temperature is saved in track data points and graphed for comparison with altitude changes. Diagnostic screens help you review engine performance from past trails. GPS speed, distance, compass, altitude, temperature, maps, wheel sensor, engine performance linked to GPS data, crash resistant, off-road design mounts below the bars for protection, upload routes from any GPS or PC, customizable user screens, model-specific integrated kits, accepts AC or DC power from virtually any vehicle, rugged handlebar mounts - 7/8 inch to 1-1/8 inch, waterproof. Screens: Data is intuitively arranged and quickly accessed using joy-stick navigation. Mapping: Accurate tracks, even in the toughest terrain. Pan, zoom, graphs, waypoints, and more.